William Mattar, P.C. is a growing law firm that focuses on car injuries. Our home office is located in Williamsville, NY, and we service areas throughout New York State, including Buffalo, Rochester, Syracuse, and Albany. William Mattar’s culture is constructed around providing the firm’s clients with renowned customer service. 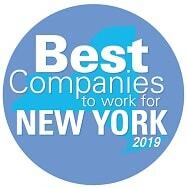 We are proud to announce that William Mattar was named one of Best Companies to Work for in New York for the 3rd consecutive year. As a firm focused on helping people, we understand that this starts with how we treat each other. We’re happy to be recognized for creating such a notably positive work environment!